The shrimps of the Infraorder Caridea, like the prawns, are accomplished swimmers. Unlike prawns, however, carideans incubate their eggs beneath the abdomen, have only two pairs of chelipeds and have the pleuron (lateral plate) of the second abdominal segment overlapping both those of the first and third segments. More than 200 species of caridean shrimp are presently known from the GBR, the most common of which are members of the Palaemonidae (subfamily Pontoninae) and Alpheidae. 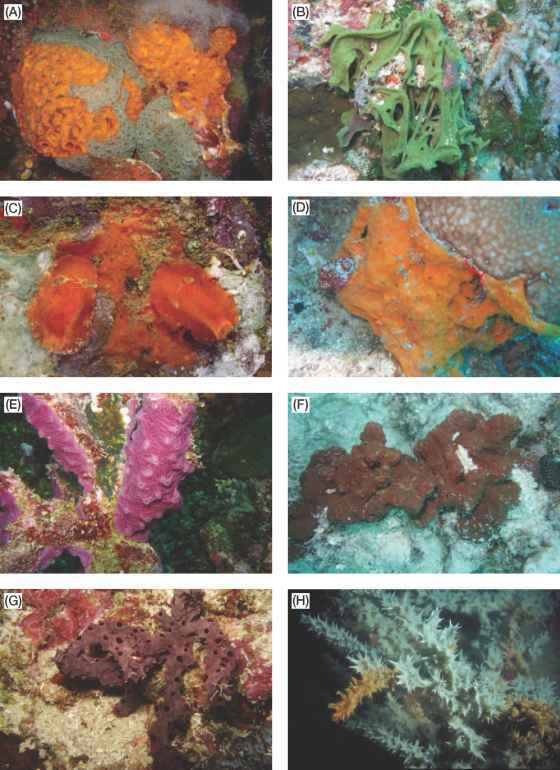 Most GBR pontonines are associates of other reef invertebrates: corals, anemones, nudibranchs, sponges, echinoderms and molluscs. Pontonines (Fig. 23.2I-L) tend to be delicate and retiring, and though common, must be searched for. One of the more easily found pontonines is Periclimenes brevicarpalis (Fig. 23.2L), which lives under the protection of the tentacles of sea anemones. Here, P. brevicarpalis rolls and sways its body, which is transparent except for its several large white patches, and orange and purple highlights. Interestingly, few pontonines have drab colouration; most are either brightly coloured or almost completely transparent. Alpheids, the snapping shrimps, are abundant throughout the GBR, but are more often heard than seen. Snapping shrimps live in burrows in sand, sponge, mud and coralline rock. The characteristic feature of the snapping shrimps is the greatly enlarged snapping claw, which, when snapped shut produces a loud, cracking sound with a localised shock wave sufficient to injure or kill small invertebrates and fish. Snapping shrimps usually live in pairs, but some form large social networks (e.g. Synalpheus; Fig. 23.2/), and many species of Alpheus cooperatively share a burrow with gobiid fish. Other conspicuous carideans on the reef include the cleaner shrimp, Lysmata amboinensis, the hinged-beak shrimps (Rhynchocinetes durbanensis; Fig. 23.2K) and the marbled shrimp (Saron marmoratus). One of the most unusual shrimps on the GBR is the harlequin shrimp (Hymenocera picta), which feeds exclusively on seastars. As a rule, caridean shrimps hide during the day and are best observed at night, when they emerge to feed.